New thinking is needed to better address deep gender gaps in access to digital technologies, seek out networks of the increasingly active elderly population, and support young people facing a rapidly transforming labour market, UN Secretary-General António Guterres told delegates on Monday, at the 2018 Internet Governance Forum (IGF), hosted in Paris by the UN Education, Scientific and Cultural Organization (UNESCO). oday, more than half the world’s population does not have meaningful access to the internet, and Mr. Guterres called for the IGF to reach out to governments, especially in developing countries, and listen to their ideas for making the Forum more productive for their needs. Referencing the UN High-Level Panel on Digital Cooperation, which he launched in July, Mr. Guterres noted that – at a time when cooperation amongst actors in the digital space has not kept pace with new technologies – the Panel is working closely with the IGF to improve digital cooperation. 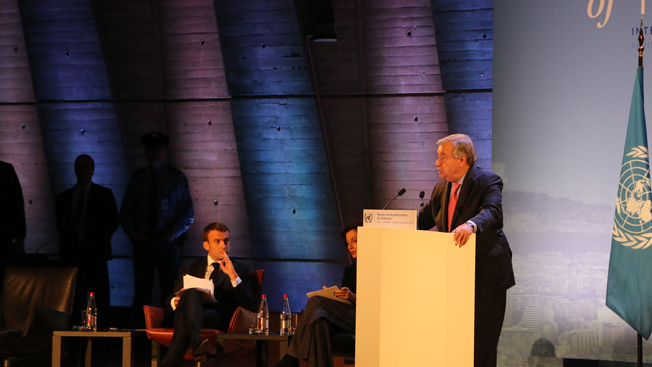 Mr. Guterres’s comments were made during his keynote speech on the first day of the Forum, which runs from 12 to 14 November: he was joined on stage by French President Emmanuel Macron and Audrey Azouley, Director-General of UNESCO. The IGF, convened annually by the Secretary-General and supported by UN Department of Economic and Social Affairs (DESA), brings together over 3,000 participants, including high-level government officials, civil society leaders, private sector and internet policy experts, to discuss international cooperation around issues such as fake news, the spread of disinformation, cybersecurity and privacy, big data, the Internet of Things, and their effects on society.